Julian Stair’s robust, succinctly designed work makes most of his material, whether he is using thick, prominently turned porcelain or coarse brick clays. 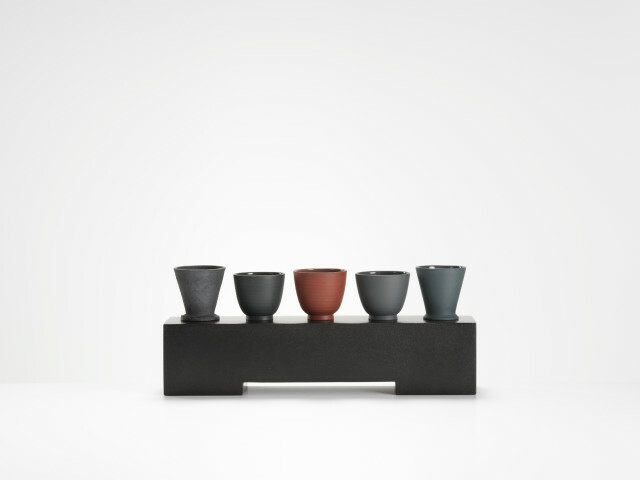 He is essentially a modernist whose pots show a broader awareness of architecture and the human-made environment. They live in this context. His pieces have ranged from well designed tablewares (including elegant cups and saucers) to monumental vessels, including funerary jars and life-size sarcophagi. Cups, saucers, caddies, teapots and other pieces placed on special stands, plinths and shelving have drawn attention to the ceremonial qualities of functional wares, as well as new types of context and presentation. Stair is as much concerned with the symbolic aspects of pottery as its sensual tactile qualities. Born in Bristol, he trained at Camberwell College of Arts in the mid 1970s, and the Royal College of Art from 1978-81. Stair lives and works in south London.